Nadah El Shazly - Ahwar. Vinyl LP. Bleep. Starting out singing Misfits covers in a local punk band, then moving on to producing her own electronic tracks and making a name for herself in Cairo’s underground scene, Nadah El Shazly’s backstory is not that unusual. Her debut album on the other hand, is an entirely unexpected story.Two years in the making, Ahwar (Arabic for marshlands) is an otherworldly record, not unlike an abstract mythological story-tale. Opening with the mangled and filtered vocals of the album’s lead track Afqid Adh-Dhakira (I Lose Memory) like an alien dream, the drones of a bowed double bass lead us into a drum groove that lays the groundwork for El Shazly’s sultry and captivating presence, singing: "(I am) coming, from a time far away. Going, escaping. Alone in the wilderness".The Arabic prose lingers over interjections of slap-back delayed guitar twangs and an avant-garde arrangement of dissonant winds, horns and seemingly random drum fills, ending with an eerie soundscape that wouldn’t feel out of place in a Giallo classic. A daring and potent statement that sets the foundations over which the rest of the album can unravel. Composed, written and produced by El Shazly herself in collaboration with The Dwarfs of East Agouza’s Maurice Louca and Sam Shalabi on co-composition and arrangement duties, the album was crafted across two continents, between Canada and Egypt, and features the crème of Montreal’s contemporary-classical and improvised music scene, most of whom aremembers of Shalabi’s own Land of Kush ensemble. In between El Shazly’s five original tracks, we are treated to an abstract coverversion of Sayyid Darwish’s classic Ana 'Ishiqt (I Once Loved). 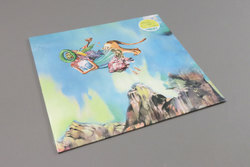 El Shazly’s haunting vocal floats over broken Kalimba and Harp arpeggios which slowly intertwine with a free, bowed double bass improv to nestle within the breaks between Younes Al-Qadhi’s early 20th century verses of love and betrayal. More than that, it is difficult to really describe, but imagine the worlds of Nico, Björk and Annette Peacock with the Arabic language as their mother tongue, re-approached through acoustic avant-jazz harmony and re-constructed with a dash of Kamilya Jubran’s modern styling of Arabic maqam and you may be somewhere close. Recorded and delicately mixed through miles of analogue cabling by Thierry Amar at Hotel2Tango and mastered by Harris Newman at Grey Market Mastering in Montreal, the album is adorned with the surrealist artwork of Egyptian artist Marwan El-Gamal and designed with custom typography by Egyptian designer Valerie Arif. All editions come with dual-language booklets featuring the lyrics in Arabic with English translation by Nariman Youssef.